With the touch of a button, an Artwork TV Frame transforms your flat panel television or high-tech video display into a breathtaking work of art that enhances any room decor. Inside an elegant hardwood frame, an ultra-quiet motor raises the canvas artwork to fully reveal the viewing screen. When turned off, your television disappears as the artwork is lowered into the picture frame. Our selection of artwork is available in 500 standard paintings by a collection of artists from around the world. Each painting is a special print applied to canvas specially designed for this continuous movement. The print is then sealed and protected by a clear layer of acrylic. Customers can supply their own artwork in digital format or if you have an existing painting, we can create a high resolution photograph of the work and incorporate this into your frame. For professional portraits a release from the original photographer is required. Each moving piece of artwork is custom designed for your specific television model. The ultra silent drive mechanism makes operation of your artwork barely more than a whisper when in motion. See a demo of an actual TV featuring motorized artwork. Click here to start designing your own TV frame, artwork, or TV mirror! With televisions becoming considerably larger and displayed in more prominent places, the black rectangle of a powered-off television can detract from an otherwise beautiful décor. 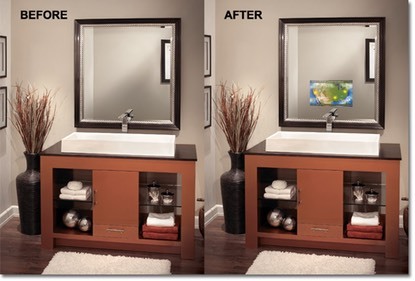 The revolutionary TV mirror glass easily solves this dilemma! This is more than an ordinary piece of glass of course. Using advanced beam splitter mirror technology prevents distortion when your tv is turned on, but when you turn off your tv, it is transformed into a decorative mirror! Every mirrored TV frame is custom manufactured to your specific TV and overall design and requirements.